Chandigarh : “Bharatiya Janata Party activists will go upto Booth level to mobilize the public about the ‘International Yoga Day’ celebration to be held on 21st June and invite them to join the celebration with Prime Minister Narendra Modi” said Sanjay Tandon, President local unit while addressing the meeting of State office bearers, District Presidents, Morcha, Cell and Mandal Presidents held today at party headquarter ‘Kamlam’. A meeting under the chairmanship of party president Sanjay Tandon was held today to discuss the preparation and participation of party activists in the ‘International Yoga Day Celebration’ and decided that a mass awareness campaign be started in the city. Party activists will contact people upto Booth/Samiti level and enroll them for the event. Sanjay Tandon said that trainings will be held at various places to train the local residents about the exercises to be done on the occasion of ‘International Yoga Day’. 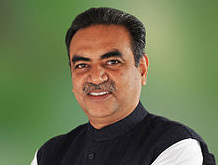 Sanjay Tandon also appealed all the party activists to aware the Chandigarhians with the slogan of ‘Healty Chandigarh-Clean Chandigarh’ to participate in the Yoga Day Celebration and also keep their surroundings clean by organizing Cleanliness Drive so as to make it ‘City Beautiful’ in real sense.